The Natural Step Canada | Page 17 | Accelerating Change. Together. Last fall, The Natural Step gathered a group of Canadian leaders in sustainability and social innovation in Wakefield, Quebec. Surrounded by the turbulent beauty of the MacLaren Falls we came to share experiences and resources, and to address the need for a qualitatively different approach to the way we work. We affirmed our commitment that to affect change greater than our individual mandates, we need many more points of connectivity into the very systems we are trying to shift. In order to identify the sort of strategic interventions that lead to breakthrough outcomes we need to be informed by a depth of understanding that can only be acquired through diverse and sometimes uncomfortable alliances. This is the message that Danielle Prapavessis and Mischa Hamara, founders of Seed by Seed and two-time participants in The Natural Step's IMPACT! 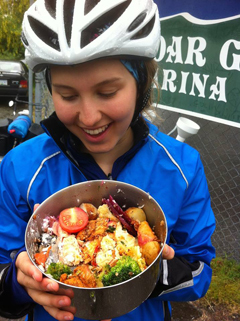 Sustainability Champions Training program, brought to 31 schools and community groups last summer as they cycled across Canada, from Victoria to St. John’s on their first speaking tour. Danielle and Mischa’s passion led them to create a non-profit organization and educational partner that would deliver speeches and workshops to young people and teach them about sustainability, our food system, and food security. They have come a long way since they brought the outline of their plan to their first IMPACT! Sustainability Champions Training session in Ottawa in 2013.